Autonomous vehicle technology often prompts discussions about profit, safety, efficiency, jobs, and more. But this innovation can change millions of lives today without introducing a single car to the road. Think: self-driving wheelchairs. I have a progressive disease, multiple sclerosis, which has now rendered me quadriplegic; I no longer have use of my hands or legs. I am a part of a growing group of people with mobility challenges. With an aging population, an increase in chronic illnesses worldwide, and longer lifespans, the number of people over age 65 is expected to nearly double in the next 30 years, to 88 million by 2050. Since disability rates rise with age, this issue will affect all of us. People with mobility challenges dream of autonomy. Assistive technology is crucial for our independence, for helping us succeed in the workplace, live meaningful lives, and get through everyday tasks that would otherwise be impossible. Self-driving wheelchairs would provide entirely new levels of independence for people living with disability. What’s more, this technology exists and is even affordable. The primary obstacle is a lack of investment from the tech community. Silicon Valley sees itself as developing technology that improves lives. It’s also famous for innovation and firsts. Self-driving wheelchairs represent an excellent opportunity for tech companies and venture capitalists to invest in a growing industry while simultaneously transforming the lives of millions. Users of power wheelchairs are the primary potential customers. In the US alone, 6 million people like me require a power wheelchair, and many of us require assistance to operate it, as I do, since I cannot use my hands. Self-driving wheelchairs uses a power chair as a base. Unlike a manual wheelchair, the power wheelchair has a motor that allows the person to move about without physically operating the wheels. An estimated 8 million people desperately need a better solution. 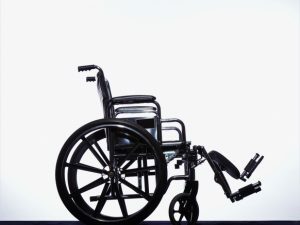 There is a broad and diverse market for self-driving wheelchair users, from children or people in nursing homes often denied power chairs due to safety regulations, to people who can’t operate power chairs for various reasons, such as difficulty with sensory or fine motor skills. Even people who are able to operate their device report it can sometimes be stressful and fatiguing—navigating through crowds and tight spaces, determining the best route, and using the right amount of precision (via neck muscles, finger, or breath) to control the chair. Here’s where self-driving car technology comes to the rescue. A handful of institutions and companies — Samsung, MIT, and Northwestern University, to name a few—are currently pursuing self-driving wheelchairs. Of all the prototypes, there is one option that is cost-effective and ready for implementation: a wheelchair designed by a Toronto-based robotics company called Cyberworks. Last summer, Cyberworks announced a self-driving wheelchair that is expected to hit the market in the next few years, at a cost of $1,000. For comparison, a power wheelchair can cost anywhere from $1,500 to $30,000, depending on the level of disability. While so far Cyberworks’ wheelchair can only be used inside, this is the first step toward self-driving wheelchair technology that operates in all terrain. Self-driving wheelchairs can be a profitable, stable market: after all, 8 million people in the US alone stand to benefit from such a technology. Companies that enable mobility-impaired users with self-driving technology can show that these types of systems are safe and reliable. For those of us with mobility challenges, a wheelchair is our car. It may travel slower, using pathways other than the open road, but it is imperative to our mobility. Now the tech industry has the chance to be an absolute hero for millions of people in the coming years, especially as the world’s population ages. Investing in assistive technologies means investing in our collective survival: disability and access is everyone’s issue.